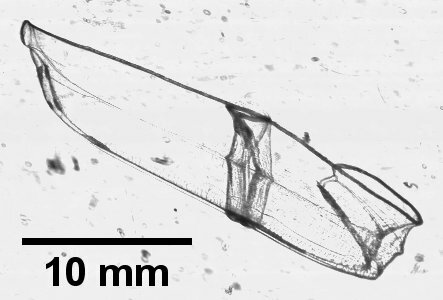 Some of the most beautiful and conspicuous animals we encounter in the plankton images are leptocephalus larvae. Eels, bonefish, ladyfish, and tarpon form a diverse superorder of fishes (Elopomorpha) that all begin their planktonic lives as leptocephalus larvae, which are characterized by long and laterally compressed bodies that are almost completely transparent. This type of larva is known by scientists to be relatively primitive, meaning that leptocephalus larval forms have been utilized by fishes for millions of years – probably since the Cretaceous period. In this image, the you can see the backbone and the myomeres along the body. On the left side, the mouth of this larva is open. 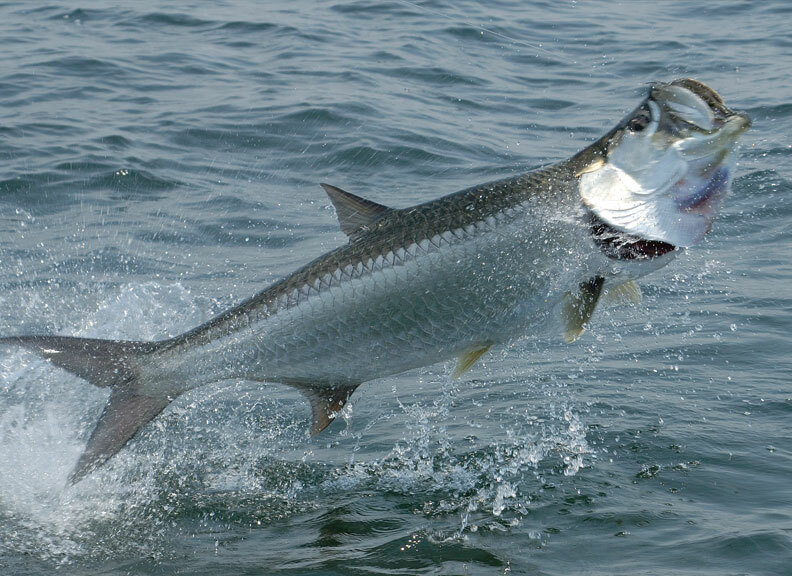 Tarpon and bonefish larvae are slightly modified from the classic leptocephalus form. Unlike the eel leptocephali, tarpon and bonefish larvae are thinner vertically and have a well-developed caudal fin, which they use to swim. 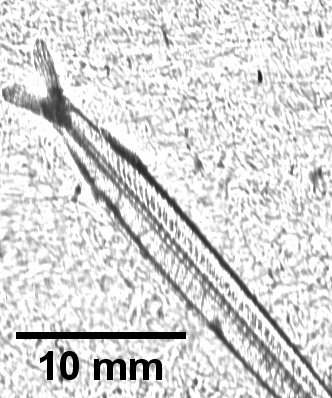 Partial image of the tail region of a tarpon, bonefish, or ladyfish. Most leptocephalus larvae (sometimes referred to as “leptos”) have a large set of teeth that protrude outward. For a long time, the diet of leptos was a complete mystery because their guts appeared to be empty. We now know that they rely on particulate matter, also known as “marine snow”, as their primary food source (Miller et al. 2013). Our in situ imaging work has revealed that leptos are quite abundant, particularly in the northern Gulf of Mexico, and have a variety of complex behaviors that may help them survive in a realm of intense predation pressure. We recently published a paper presenting evidence that the morphology of these leptos indicates that they likely serve as Batesian mimics of cestid ctenophores, which are strikingly similar in appearance (Greer et al. 2016). By resembling an animal with low nutritional value that predators avoid (the cestid ctenophore), the leptos gain protection from predators. The only perceivable morphological difference is that leptos have a head and a dark backbone with myomeres (muscle strands) that are visible when viewed through a shadowgraph imager, while cestid ctenophores lack these features. For a fish predator relying on vision in a complex ocean light environment, it may not be able to tell the difference, which could explain why predation rates on leptos are much lower than expected (Miller et al. 2015). Leptocephalus larva – note the similarity in morphology to the cestid ctenophore above. Leptos display complex behaviors that can make them difficult to identify in the images (and likely has a similar effect on predators). This one is curled up. The main cues that this is indeed a lepto are the visible myomeres, and the head and tail are meeting on the left and right sides of the body, respectively.